Across many species, the sequences of genes that interact with hosts and/or pathogens change faster over time than many other parts of the genome. A nifty new study recently released in PNAS examines the rapid changes of a Red Queen’s race directly, by experimentally coevolving hosts with a pathogen and sampling the genetic diversity of their populations over time. Experiments with coevolving hosts and pathogens generally produce a recognizable pattern of rapid adaptation. In a small but growing number of cases, biologists have set up experimental coevolution of species that can be frozen or go dormant at particular timepoints. Then the hosts and pathogens can be sampled over time as they co-evolve, preserved, and reconstituted (thawed or stimulated out of dormancy) so that populations from different points in time can be tested against each other. These “time-shift” experiments can generally find two coevolutionary dynamics. The first of these is a continual arms race between hosts and pathogens, in which host defenses and pathogen virulence factors are constantly overtopping each other. If an arms race is going on, a time-shift experiment should reveal that hosts sampled at a given time point should be relatively well adapted to fight off pathogens from a time point in their past, but poorly adapted to fight off pathogens from future time points. The other possible dynamic is frequency-dependent coevolution, in which hosts’ vulnerability to pathogens is determined by compatibility of variants at host defense genes with variants at pathogens’ virulence genes. A pathogen with virulence variants that can infect most hosts will rapidly increase in frequency, but this reduces the fitness of hosts carrying vulnerable variants, and they decrease in frequency until the majority of the hosts carry variants that the most common pathogen cannot attack. Then, a new pathogen variant that can attack the new majority host variant will have the advantage, and increase in frequency … and so on. This isn’t the continuous escalation of an arms race, but cyclical. 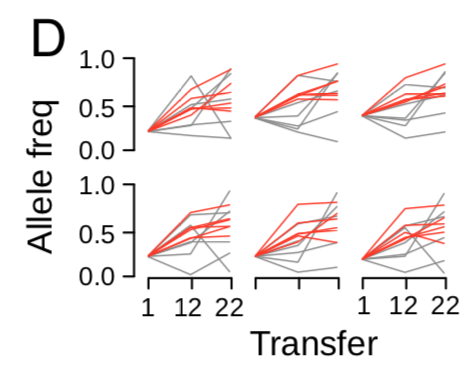 In a time-shift experiment, frequency-dependent dynamics manifest as a sort of temporal local adaptation: hosts from a given time point will be less vulnerable to pathogens from the past, but also less vulnerable to pathogens from the future. Time-shift experiments in different host-pathogen pairs have found both arms races and frequency dependence, and some have incorporated genome sequencing to begin to identify gene variants involved in these dynamics. However, whole-genome sequencing at multiple time steps in a time-shift experiment is still new ground, and this is the contribution of the new PNAS paper, lead-authored by Andrei Papkou. Papkou and his coauthors coevolved replicate populations of the simple roundworm Caenorhabditis elegans with the bacterium Bacillus thuringiensis for 23 one-week-long C. elegans generations. They took time-shiftable host and pathogen samples at the end of each week, and conducted whole-genome sequencing of pooled host and pathogen populations from weeks 1, 12, and 23. They also ran host and pathogen populations through the experimental evolution protocol in isolation from each other, to provide a “coevolution-free” control. In addition to performing the “time-shift” experiment with host and pathogen samples from the three time points, they sequenced pooled samples of the host and pathogen populations from each timepoint, to identify changes in allele frequency over time, across the genomes of each species. 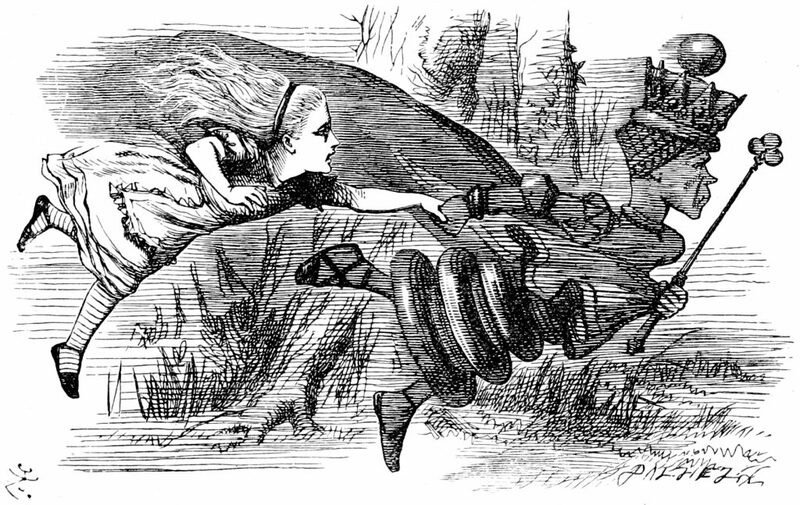 The overall pattern in the C. elegans–Bacillus experiment was clearly consistent with frequency-dependent Red Queen dynamics. The worms showed reduced fitness when infected by contemporary pathogen samples, compared to time-shifted past and future samples; and the bacteria showed the inverse pattern. However the genomic data revealed something more complex. If the worm’s pathogen-resistance loci were under frequency-dependent selection, it should be possible to identify them by roughly equal and opposite changes in allele frequency over time — variants that were vulnerable to the pathogen in the past should be resistant at a later point in time. Papkou et al. analyzed whole-genome sequence data of C. elegans population samples to find loci that experienced selection in one direction from weeks one to 12 of the experiment, and the opposite direction in weeks 12 to 22. And … there weren’t any. There were a number of sites that experienced positive selection in the first period, but all of these showed no sign of selection in the second period — more consistent with incomplete selective sweeps than either frequency-dependent selection or arms race dynamics. This is, to be frank, a weird result. What’s weirder is that the coauthors didn’t find any other loci that showed evidence of selection across replicates in the second half of the coevolution experiment. That means that, although there’s evidence for ongoing coevolution with pathogens creating selection on hosts, the specific loci under selection changed in the course of coevolution, and probably differed among the replicate experiments — particularly in the second half of the experimental time frame. On the pathogen’s part, however, the strongest pattern in the genomic data matched the organismal-level results much more cleanly. Papkou et al. identified oscillating selection acting on a plasmid carried by B. thuringiensis, which includes coding sequence for a key bacterial toxin. In the first half of the experiment, coevolution with the hosts selected for individuals to carry more copies of the plasmid, and thereby produce more toxin; in the second half, selection favored individuals carrying fewer copies. These changes in the plasmid copy number correlated very neatly to the bacteria’s effect on hosts in the time-shift experiment — past and future bacteria populations, which each had fewer toxin-plasmid copies, did less to reduce host fitness. Overall, then, this application of genomic data to a classic coevolutionary experiment design does what adding genomic data tends to do: complicate the patterns we see at the organismal level. This entry was posted in Coevolution, genomics and tagged Caenorhabditis elegans, Red Queen. Bookmark the permalink.